The following rules have been adopted by the NATIONAL ENTOMOLOGY SCENT DETECTION CANINE ASSOCIATION for certification. The tests are designed to determine the proficiency of the work dog team for certification. Each test is based on a pass/fail evaluation. No hosted evaluation may be utilized for profit. A Team will consist of a handler (person trained to handle/work a dog) and a K-9 (dog trained for scent detection). Together the two make up a Team. Only the handler and K-9 that passed NESDCA Certification Standards together may claim themselves as a NESDCA Team. If at any time the handler and K-9 separate, they are no longer NESDCA Certified. NOTE: NESDCA DOES NOT CERTIFY DOGS OR HANDLERS, ONLY TEAMS. Entomology Scent Detection Canine Teams wishing to be tested and certified under these rules and by this Association must be regular members of this organization in good standing. Dog must have received training to detect the scent for which the team is certifying. Dual scent trained dogs will not be certified under NESDCA Standards. No overly harsh or inappropriate physical corrections by the handler to the dog will be permitted. At the Evaluators discretion, any such behavior will be grounds for a failure of certification. and accuracy. Handlers will be observed for ability to work, read and overall control of his/her K-9. Upon successfully passing certification the team will be issued a certificate stating the team is NESDCA certified to detect the scent for which they certified. The certification will be valid for one (1) year from the date of issue. A NESDCA certification of a Regular member K9 team will ONLY BE VALID when the K9 team is being utilized for the scent which they certified under. ***NOTE*** Under NO circumstances will a NESDCA K9 team certification be valid when the team is being utilized for ANY and ALL NON ENTOMOLOGY SCENT DETECTION PURPOSES OR BEING USED IN A MANNER INCONSISTENT WITH THE RULES, BYLAWS, AND CODE OF ETHICS OF THE ASSOCIATION. At no time during any of the offered certification tests will sticks, whips of any type, pinch collars, electronic or ultrasonic devices be used on the K9’s. Fees and expenses associated with travel will be required. Fees associated with travel for evaluators will be covered to include, expenses of travel, lodging, rental car, administrative, etc. required by evaluators, per evaluator. If travelling by vehicle the evaluators will be reimbursed at the current Government rate per mile and per evaluator if required. Per diem will be charged at a flat rate per evaluator, per day to cover all expenses and determined by the Board of Directors. Mode of travel, and travel arrangements, no matter the distance, is at the discretion of the evaluators. All of the scent tests are scored on a pass/fail basis. A work dog team that fails may reapply for testing at the next and most convenient date that is after fourteen (14) days from test failure. Any work dog team that fails a test and feels that they have been judged unfairly, will, at the time of the test notify the Evaluator of his/her intent to appeal. The tested team handler will then file a complete report of his/her observations and the reasons they feel they were judged unfairly. The Evaluators having been notified of the appeal will file a report of their observations, all testing sheets and basis for failing the team. All reports will be filed within fourteen (14) days of the test to the Certification / K-9 Chairperson. The decision of the Certification / K-9 Chairperson will be final. Findings of the Certification / K-9 Chairperson will be forwarded to the Executive Board who will in turn forward the findings to the tested team’s handler and Evaluators. If during the time period that a certification certificate is issued, the K-9 team re-tests AND FAILS, then the initial certificate which was issued will become NULL AND VOID. Further, a letter to this effect will be sent to the K-9 team and their employing company if applicable, including the recommendation that they be re-tested after (15) days of this notification. During the time of failure and until the team retests and passes, the team, it’s employer, or any associates there-of will not present the canine team as certified or endorsed in any manner by NESDCA. Evaluators will accompany the team to observe the entire test. Warehouse, office buildings, and multi-room interiors. Set at least thirty (30) minutes prior to the start of a certification. K-9 must alert at source. Pseudo scents are not allowed for use in any certification. 2 distracters will be put out at each certification. The Chief Evaluator will decide what distracters will be used. Distracters will not be placed in the same room as a live hide. Will be provided by the team certifying in two separate containers. They must also be approved by the certifying officials for content, packaging, and safety. Must meet all standards set forth by NESDCA and approval of the evaluators or the evaluation will not be conducted. Will designate the area of the structure to be used for the test. If it is obvious to the evaluator that the dog is not working, the evaluator will inform the handler and the handler will remove the dog from the test area and have not more than 30 minutes to return to the test area to repeat the test. Failure of the dog to work a second time constitutes a failure for the test. This test may be done off lead. Equipment normally used, collars, harness, etc., may be used. The handler will accompany the dog throughout the test, and may encourage his/her dog with commands and praise as needed. The dog’s indication of the find must be obvious to the evaluator. All tests given to the K9 team will be on a pass/fail basis. The Chief Evaluator will determine if the team will be certified upon the completion of the test. The handler and dog will be considered as a team and it is the team who will be certified. If the dog changes handlers, a new team exists and the team will need to be certified. This certification will be valid for one (1) year from the date of issue as defined in Certification Validity paragraph. It is the Evaluators decision on the quantity each of the hides will contain, as long as he or she remains within the minimum and maximum amounts set in the certification standards. Each Handler is responsible for notifying the Evaluators of the type of alert (aggressive or passive), the Evaluators can expect. There will be only one (1) negative response allowed and it cannot be on a placed distracter which constitutes an automatic failure. Although a negative response is allowed the handler must call the correct two live hides to certify. A time limit of 15 minutes shall be placed on the search. The Evaluator can adjust this time limit to varying size rooms. The time limit will be set, the Handler advised, and is final once the search begins. The Handler certifying will initial next to the time set before the search begins in agreeing with the adjusted time limit set. The scent exercise will consist of a structure (requiring 4 rooms and may vary in size, location and environment) designated/approved by the Evaluators. The Handler and the Canine will start at a point determined by the Evaluators. Both live hides will not be placed in the same room. There will be a fifteen (15) day waiting period before attempting to certify again, unless circumstances at the time of the certification has been determined by the Evaluators to warrant another attempt. Within that fifteen (15) day period the team cannot represent themselves as NESDCA Certified. Only NESDCA Certified Evaluators may certify a K-9 team. A Certification Team will consist of two evaluators with the Senior Evaluator being the Chief Evaluator, unless the Senior Evaluator has been involved with training of the dog and/or handler being certified. All decisions made by the Chief Evaluator at the certification are final. The handler must be certifying with the dog they will be working with for scent detection. The handler must also be a member in good standing when attempting to certify scent detection. Any dog displaying aggressive behavior, considering the totality of the circumstances, may be denied testing by the evaluators. UPON SUCCESSFUL COMPLETION OF THE CERTIFICATION, A CERTIFICATE WILL BE ISSUED TO THE PASSING TEAM. THE CERTIFICATE WILL STATE THE SCENT THE TEAM IS CERTIFIED TO FIND. Ex. “Live Termite Scent, Bed Bug Scent, etc.” IN NO CASE SHALL THE CERTIFIED TEAM STATE IN ANY FORM/FASHION THAT THEY HAVE THE ABILITY TO FIND ANY SCENT THAT DOES NOT APPEAR ON THE CERTIFICATE. A NESDCA CERTIFICATION IS VALID FOR ONE YEAR FROM THE DATE OF ISSUE. 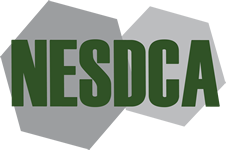 NESDCA RESERVES THE RIGHT TO REFUSE OR RETRACT A CERTIFICATION AT ANY TIME FOR ANY JUSTIFIED REASON FROM THE EXECUTIVE BOARD, CERTIFICATION / K-9 CHAIRPERSON, OR EVALUATORS. K-9’s must find LIVE TERMITES ONLY to certify. There will be 4 hides, 2 of live termites and 2 distracters, placed in the search area. K-9’s must find LIVE BED BUGS ONLY to certify. There will be 4 hides, 2 of live bed bugs and 2 distracters, placed in the search area. K-9’s must find LIVE CARPENTER ANTS ONLY to certify.. There will be 4 hides, 2 of live carpenter ants and 2 distracters, placed in the search area. K-9’s must find LIVE MICE/RATS ONLY to certify. There will be 4 hides, 2 of live mice/rats and 2 distracters, placed in the search area. BOTH LIVE HIDES MUST BE LOCATED TO PASS. ONE FALSE INDICATION IS ALLOWED BUT CANNOT BE ON A PLACED DISTRACTOR. A Certified Law Enforcement background is required as a K9 handler, trainer, and/or evaluator. NESDCA Evaluators are appointed by the Certification / K-9 Chairperson. To become an Evaluator you must complete the application form, along with a resume outlining your experience and forward to the Secretary of NESDCA. The Secretary will ensure the application is completely filled out and a resume is attached then forward the packet to the Certification / K-9 Chairperson. You will be required to provide information to the Certification / K-9 Chairperson, at their request, to verify your application. Upon approval from the Certification / K-9 Chairperson you will be required to apprentice six (6) evaluations with three (3) separate NESDCA Evaluators before becoming a NESDCA Evaluator. NESDCA Evaluators are expected to hold the highest moral and ethical standards providing a fair and unbiased evaluation. NOTE: The owner/principal of a training facility is NOT eligible to obtain the status of evaluator. All incomplete applications will be returned to the sender. A NESDCA EVALUATOR STATUS MAY BE REVOKED AT ANY TIME, FOR ANY REASON. your experience including the above stated requirements with all documentation to the Secretary of NESDCA. The Secretary will ensure the application is completely filled out and a resume is attached then forward the packet to the Certification / K-9 Chairperson. You will be required to provide information to the Certification / K-9 Chairperson at their request to verify your application. Upon approval from the Certification / K-9 Chairperson you will be notified by the Executive Board of your Accredited Status. A NESDCA TRAINING FACILITY ACCREDITATION MAY BE REVOKED AT ANY TIME, FOR ANY REASON.